Google's recent annual shopping event-Great Online Shopping Festival (GOSF) attracted two million visitors, nearly double from the inaugural event last year, and demand for products in categories like winter apparel, electronics, shoes, watches and travel, was rather strong. Google had partnered with more than 200 online retailers for this shopping festival including eBay, Snapdeal and Jabong, and senior executives at these e-retailers highlighted that daily sales were nearly thrice the average turnover. This festival which was originally planned to be held between December 11 and 13, was extended by an additional day, given the strong interest from buyers. In addition, niche e-retailers like LensKart, also registered a 50 per cent increase in their sales during this period. Nitin Bawankule, Google India Director-eCommerce pointed out that high-end segments like cars and housing also benefited from strong consumer demand during this online festival, with Tata Housing receiving bookings for more than 55 flats. 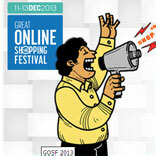 The boom in this segment is clearly visible with nearly a third of the buyers at GOSF were first time online buyers. In addition, an online survey by Franchise India Research across 500 urban customers also highlighted that a similar proportion of respondents shopped during this festival. Google, too, had promoted this event aggressively along with retailers via direct mailers, SMSs, and Google advertisements. In addition, banks also supported this event through discounts and additional ‘points’ offered on use of their credit and debit cards. However, marketing strategists point out to caution, as the online retail industry’s emphasis on discounts and allied promotional tools would not be viable in the long-run.